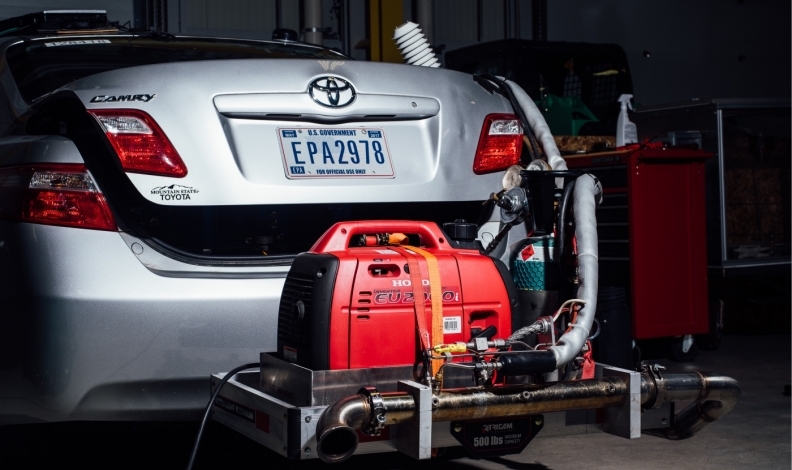 Canada could be on an emissions collision course with the U.S.
Canada piggybacks on emissions testing by the U.S. EPA in Ann Arbor, Mich. That might change if U.S. standards deviate from Canada's CO2 goals. Canada could find itself drawn into the tussle over U.S. emissions standards if a review of current regulation leads to their relaxation. Former U.S. Environmental Protection Agency Administrator Scott Pruitt ordered a scheduled mid-term review of the Obama-era emissions regulation to proceed, covering greenhouse-gas emissions standards for 2022-2025 model-year light-duty vehicles. Pruitt said automakers face challenges meeting those standards, adding they raise “potential concerns related to automobile safety, and results in significant additional costs on consumers, especially low-income consumers,” according to the U.S. Federal Register. “On the whole, the Administrator believes the MY 2022 to 2025 greenhouse-gas-emissions standards are not appropriate and, therefore, should be revised as appropriate,” the notice said. Canadian and U.S. emissions standards have been aligned since 2011, presenting a potential challenge if Washington decides to relax implementation and Ottawa doesn’t follow suit. Canada also relies on the EPA’s certification process rather than conducting its own tests except for auditing purposes. If standards diverge, would Canada conduct its own testing? Further complicating things, more than a dozen states led by California want to retain a federal waiver allowing them to set their own standards. Before standards were harmonized, automakers faced extra costs producing and certifying different versions for California (and allied states) and the rest of the United States. Canada has committed to reduce total greenhouse gas by 40 per cent from 2005 levels by 2030. Transportation accounts for about 25 per cent of Canadian greenhouse-gas emissions, according to Environment and Climate Change Canada. Light-duty vehicles, such as cars and pickups, emit an estimated 12 per cent of the total. In August, Canada launched its review into the country’s joint vehicle-emissions standards with the United States. “This review will help us enact regulations that will protect the environment and grow the economy,” Environment Minister Catherine McKenna said in a news release. Throughout the process, the government will “pay close attention” to what is being done in the United States, particularly the California standard. Automakers support the reviews, but don’t relish a return to checkerboard standards. “We’re all concerned,” said Mark Nantais, president of the Canadian Vehicle Manufacturers Association. He said the industry will push to preserve a single standard that includes Canada, he said. “That’s what provides the most benefit to Canadians and provides the most environmental benefit,” said Nantais. The two countries seem headed in opposite directions, said Global Automakers of Canada President David Adams. “If things change in the states, then things will change here as well unless there’s some proactivity by the government in Canada to do something different,” Adams said. Not everyone is wringing their hands. “It’s time for Canada to start drafting the divorce papers and establish our own, Canada-specific regulations to maintain the current schedule of emissions targets,” an opinion piece published by the Pembina Institute argued following the EPA’s announcement. “It’s critical that we not lose any momentum on reducing transportation emissions,” Lindsay Wiginton, managing director of transportation and urban solutions at the environmental think tank, said in an interview. Canada should ally itself with California and the other dissident states, she said. Together they represent 40 per cent of the North American car and light truck market. Wiginton noted studies show the cost of complying with the 2022-25 standard is likely to drop below original projections.